Fred Van Lente, who masterfully penned the first series, resumes his duties in this second chapter, which transplants the team from the detective-flooded streets of New York City to the deepest jungles of Madripoor. But that’s not before he takes the opportunity to initiate new readers with a quick, newsreel-styled recap of the first series. It’s a perfect way to cover the complicated material of that first tale, while also setting the mood and tone of the era he’s emulating. Where that historically-appropriate footage leaves off, Van Lente picks up with the issue’s dialog, which seems to leap right off of those ancient movie screens and onto the page. It’s a cool enough trip down the path of nostalgia that I could almost lose myself in the atmosphere alone. Eventually Van Lente does trip over a few hurdles, however. Despite the double-sized recap section, much of this story is dependent upon a close understanding of elements from the first series that are left undisclosed to new readers. While his cast’s dialect is responsible for much of the issue’s flavor, he also refuses to shake it up between characters. Some of the effect is bound to get lost if everybody speaks like a hard boiled detective, and that’s precisely the case here. Many times, amid the shadows and identical speaking patterns, it’s tough to isolate who’s doing the talking and who’s merely listening. In the end, are these minor gripes? Sure, but they’re valid ones nonetheless. 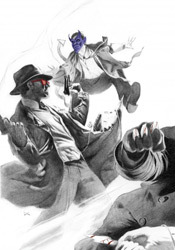 Dennis Calero’s artwork, like those of each of his Noir counterparts, is crucial to the success of this series. So much of what makes such a story work depends on the deep shadows, careful compositions and sharp mood set by its visuals that it’s tough to imagine any revival finding much success in the hands of a middle-of-the-road talent. Calero manages the job effectively, employing a style that’s oft reminiscent of Jae Lee in its use of selective lighting and densely layered surroundings. The style is particularly effective in the title’s first fight scene, when Logan and Angel are caught off-guard by an onslaught of shadowy natives. The action is quick and chaotic, bewildering but deliberately and successfully so. My sole qualm with the artwork lies with the decision to offer it in full color. Especially contrasted by the black and white tones of the newsreel footage that opens the issue, the lush palette and full tones seem at odds with its inspirations. The array of color gives this story a more modern flavor that seems counterproductive to the thick atmosphere and weighty mood the line is chasing. Mark of Cain may not be as captivating as the original series, but it still holds its own as a handsome addition to the Marvel Noir line. It’s effectively written, gorgeously illustrated, and despite a few slips and flaws worthy of a closer look from fans of the first mini-series. New readers may find that their mileage varies. Borrow it.